Not so long ago at a large electronics retailer, I saw a young couple arguing about a home theatre system. Being nosey (and sensing a train-wreck in progress), I eavesdropped. It was informative. The male (I’ll call him Dave – he looked like a Dave) had his heart set on an amp, sub-woofer, centre and large floor-standing left and right plus bookshelf rear speakers. The female (I’ll call her Davina) wasn’t having a bar of it. “Those bloody things are too large. They’ll take over our lounge,” she complained. Dave continued ogling a pair of monolithic speakers and their matching R2D2-sized sub. Davina fumed. The salesperson next to them looked flabbergasted. I felt for him. He was in a tricky situation: doomed if he supported Dave, damned he backed Davina. After much debate, the couple settled on a small sound bar. It sounded terrible (and cost almost as much as the set-up Dave wanted). It didn’t matter. Davina was happy. Dave had resigned to his fate. The sales guy just looked relieved it was over. Now it all made total sense. The Daves of this world want a setup with big speakers. The Davinas want something that looks more subtle and sophisticated. Their ideal setup would have to blend into the lounge rather than dominating it. It should sound good and above all, look good and be easy to set up. So, can these conflicting needs ever meet in the middle? Are sales people doomed to forever be referees between big speaker ogling Daves and soundbar wanting Davinas? None of this has been lost on Sonos. They’re the folks who made wireless multi-zone speakers a simple proposition. Now they’re back with what could be the answer to this most vexing issue. It comes in the form of a speaker designed to work with TVs that Sonos have branded the Playbase. As its name suggests, it’s a rectangular base designed to sit under the plinth stand of most TVs to act as a sound bar. If you’ve ever wondered why soundbars took off, turn the volume up to normal listening levels on most modern TVs. Their picture may have improved, but the audio is either shrill and fatiguing or muddy, which ruins dialogue. Picture obsessed TV manufacturers are treating audio as the poor cousin. While the Daves of the world seek to remedy this with amps and big speakers which lack WAF and stress out sales people, others are going for a sound bars. 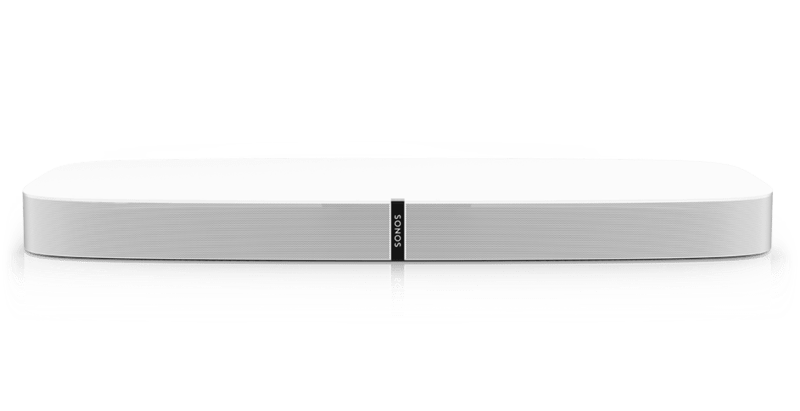 When it comes to WAF, soundbars are a good option. They’re compact, easy to set up and unobtrusive. This makes them ideal for apartments and small living rooms. Unfortunately, many sound almost as bad as the TVs they’re hooked up to. 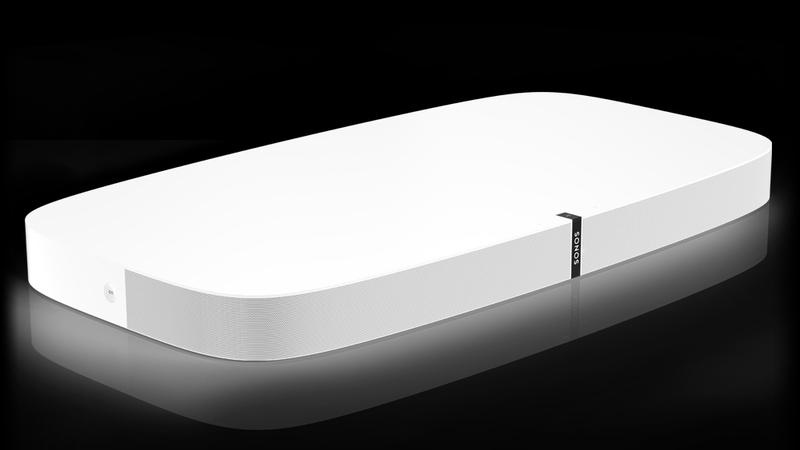 Sonos have designed the Playbase to be as WAF-friendly as possible. That said, the Daves of the world aren’t forgotten. Sonos have also honed the Playbase’s audio reproduction. The improbable bass levels delivered by the Playbase come via a custom designed woofer and S – shaped tuned bass port. The rest comes from a front facing array of 6 midrange drivers and two tweeters mounted in the left and right front corners. In-house developed digital signal processing delivers a soundstage that is not only wide, but is deep too. Somehow, the Playbase also projected height into the audio mix. Watching a Wall-e demo, audio not only moved from left to right but forwards, backwards and up and down. I don’t know what audio magic Sonos used to achieve this, but I suspect reflected sound and very clever digital signal processing played a big part. Audio equipment manufacturers usually showcase their gear in rooms with carpeted floors and soft furnishings. Not so with the Playbase. It was demonstrated in a chic industrial-style apartment with concrete floors, no drapes or soft furnishings. The audio delivered in this environment should have been bright, echo-laden and terrible. It wasn’t. This is thanks to what Sonos call Trueplay. The mic in the smartphone/tablet used as its remote-control listens as the Playbase plays a series of test tones. These get used to map out your listening environment. Custom audio processing tailors the audio so it sounds as good as possible. This is why the acoustics didn’t sound as if they were belted out of a concrete bunker. The Playbase delivered crisp, soft and accurate-sounding audio. Getting set up with Trueplay is dead easy and makes such a big difference to audio reproduction. The other big win is the lack of cable clutter. The Playbase uses a line-out from the TV and a power plug. Because it features Sonos’s wireless technology, adding rear surrounds and a sub needn’t require wires snaking across the floor. That said, the built-in bass driver and audio processing meant that extra speakers might not be needed. The Playbase’s compact form factor, lack of cable clutter and easy setup makes it ideal for Davinas. Decent audio should also keep the Daves happy too. While no RRP information has yet to be confirmed, the Playbase will most likely retail for about $1300. This may sound like a lot, but there’s no amp or other speakers needed. Because of this, the Playbase works out as good value for money.